Keyword Research is vital to any effective search engine optimization campaign. If you optimize your site for the wrong keywords you could miss out on lots of traffic and potential customers that are trying to find what you do. I have broken up the keyword research process in phases to make it easy to understand. Initial Keyword List: To start your keyword research you want to brainstorm a starter list of keywords, phrases, and terms that you feel people would use to find you. Since you probably have a pretty good idea about your industry, you could probably come up with 5-10 keywords that people would use to find you. That list that you just created will act as a starting point to find other keywords and phrases that you may have missed or didn’t think about. Analytics Data: If possible, look through your analytics data to see which keywords people used to find you. Ideally if you have goals set up, for example, you are tracking a thank you page on your contact form, sort your keywords by contact forms submitted. This will help you find keywords that most importantly converted to leads or sales. Keyword Research Tool: There are plenty of good keyword research tools that you can use to find additional terms, along with their search volume. Even some of the free keyword tools out there are almost, or as powerful, as the paid tools. Put your initial keyword list into these keyword tools and they will generate a huge list of related terms that you can add to your master keyword list. Analyze Your Master Keyword List: Once you have come up with your master keyword list, find the words that are most relevant to what you do and the content on your site. 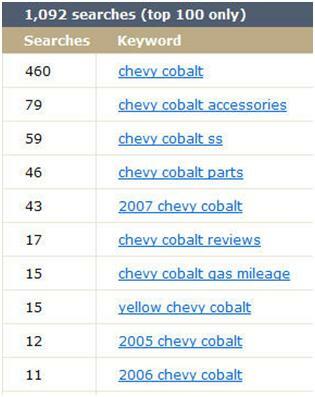 Use those keyword tools to see how often each of those terms are actually being searched. Even though the tools give you estimates, you can still get a pretty good estimate. Test in PPC (Optional): I made this step optional because some smaller businesses simply do not have the funding to spend on pay-per-click campaigns. However if you are able to, test out those keywords in Google Adwords or Yahoo! Search Marketing. PPC advertising is great for seeing if those terms are actually getting searched. Once you have enough data that is statistically significant you can pull some hard numbers to show which keywords/phrases are being searched.